where \(w\) and \(b\) are learnable parameters and \(\epsilon\) represents observation noise. Specifically \(w\) is a matrix of weights and \(b\) is a bias vector. Let’s first implement linear regression in PyTorch and learn point estimates for the parameters \(w\) and \(b\). Then we’ll see how to incorporate uncertainty into our estimates by using Pyro to implement Bayesian regression. Let’s begin by importing the modules we’ll need. We will take the logarithm for the response variable GDP as it tends to vary exponentially. 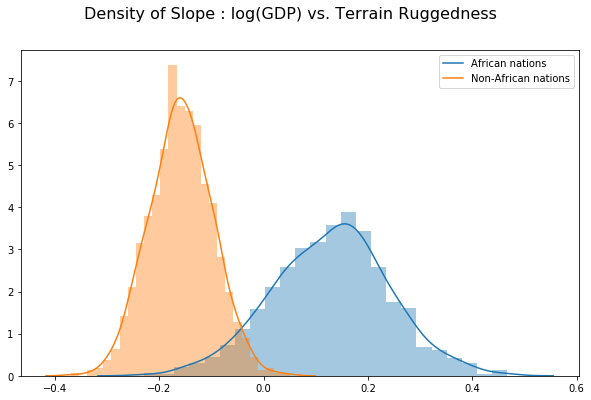 We would like to predict log GDP per capita of a nation as a function of two features from the dataset - whether the nation is in Africa, and its Terrain Ruggedness Index. Let’s define our regression model. We’ll use PyTorch’s nn.Module for this. Our input \(X\) is a matrix of size \(N \times 2\) and our output \(y\) is a vector of size \(2 \times 1\). The function nn.Linear(p, 1) defines a linear transformation of the form \(Xw + b\) where \(w\) is the weight matrix and \(b\) is the additive bias. 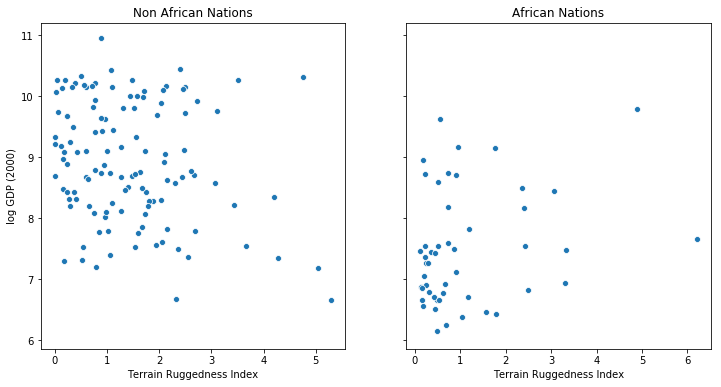 We include an extra self.factor term meant to capture the correlation between ruggedness and whether a country is in Africa. Note that we can easily make this a logistic regression by adding a non-linearity in the forward() method. We will use the mean squared error (MSE) as our loss and Adam as our optimizer. We would like to optimize the parameters of the regression_model neural net above. We will use a somewhat large learning rate of 0.05 and run for 500 iterations. Bayesian modeling offers a systematic framework for reasoning about model uncertainty. Instead of just learning point estimates, we’re going to learn a distribution over variables that are consistent with the observed data. In order to make our linear regression Bayesian, we need to put priors on the parameters \(w\) and \(b\). These are distributions that represent our prior belief about reasonable values for \(w\) and \(b\) (before observing any data). We now have all the ingredients needed to specify our model. First we define priors over weights, biases, and factor. Note the priors that we are using for the different latent variables in the model. The prior on the intercept parameter is very flat as we would like this to be learnt from the data. 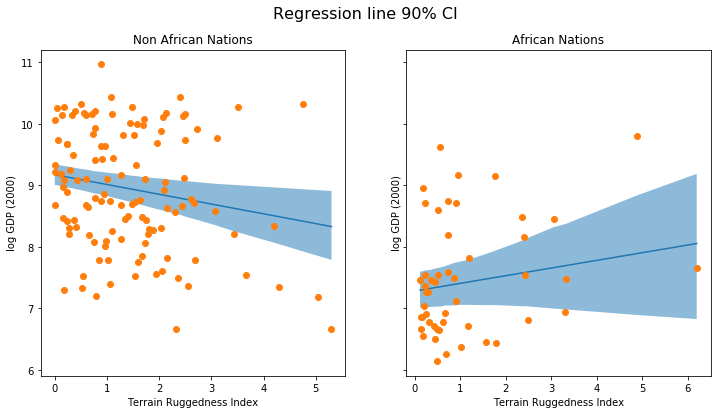 We are using a weakly regularizing prior on the regression coefficients to avoid overfitting to the data. We wrap regression_model with random_module and sample an instance of the regressor, lifted_reg_model. We then run the regressor on x_data. Finally we use the obs argument to the pyro.sample statement to condition on the observed data y_data with a learned observation noise sigma. In order to do inference we’re going to need a guide, i.e. a variational family of distributions. We will use Pyro’s autoguide library to automatically place Gaussians with diagonal covariance on all of the distributions in the model. Under the hood, this defines a guide function with Normal distributions with learnable parameters corresponding to each sample() in the model. Autoguide also supports learning MAP estimates with AutoDelta or composing guides with AutoGuideList (see the docs for more information). In Part II we will explore how to write guides by hand. To do inference we’ll use stochastic variational inference (SVI) (for an introduction to SVI, see SVI Part I). Just like in the non-Bayesian linear regression, each iteration of our training loop will take a gradient step, with the difference that in this case, we’ll use the ELBO objective instead of the MSE loss by constructing a Trace_ELBO object that we pass to SVI. As you can see, instead of just point estimates, we now have uncertainty estimates (auto_scale) for our learned parameters. Note that Autoguide packs the latent variables into a tensor, in this case, one entry per variable sampled in our model. 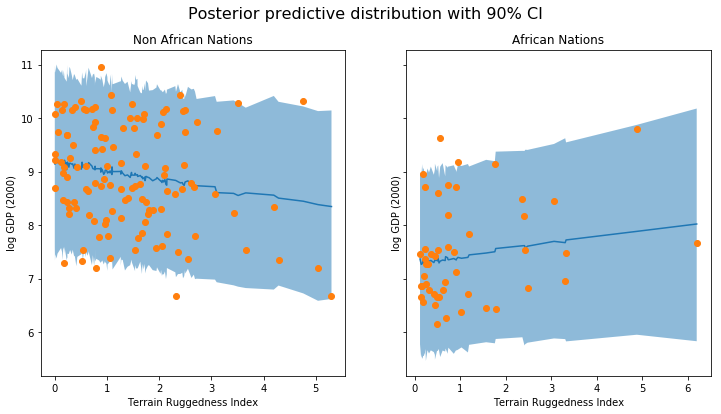 To evaluate our model, we’ll generate some predictive samples and look at the posteriors. Since our variational distribution is fully parameterized, we can just run the lifted model forward. We wrap the model with a Delta distribution in order to register the values with Pyro. We then store the execution traces in the posterior object with svi.run(). The above figure shows the uncertainty in our estimate of the regression line. Note that for lower values of ruggedness there are many more data points, and as such, lesser wiggle room for the line of best fit. This is reflected in the 90% CI around the mean. We can also see that most of the data points actually lie outside the 90% CI, and this is expected because we have not plotted the outcome variable which will be affected by sigma! Let us do so next. We observe that the outcome from our model and the 90% CI accounts for the majority of the data points that we observe in practice. It is usually a good idea to do such posterior predictive checks to see if our model gives valid predictions. In the next section, we’ll look at how to write guides for variational inference as well as compare the results with inference via HMC. See an example with a toy dataset on Github.